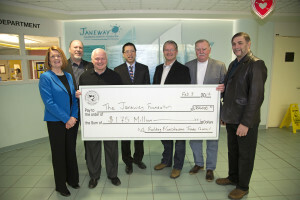 Thank you Newfoundland and Labrador Building Construction Trades Council for your significant donation of $1.75 Million. This generous gift, on behalf of your construction workers, will build three integrated operating rooms at the Janeway Hospital. The new operating rooms will assist in providing safer, less invasive procedures and higher efficiencies in the Janeway’s surgical program, during the more than 5500 surgeries performed annually.